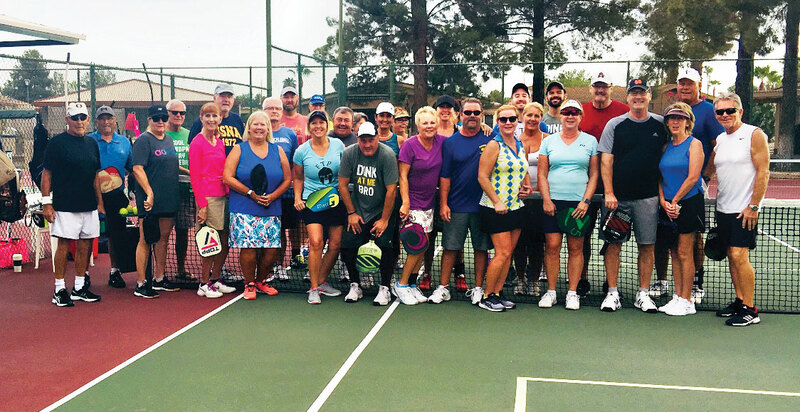 The SunBird Pickleball Club is turning up the heat on the courts this summer! 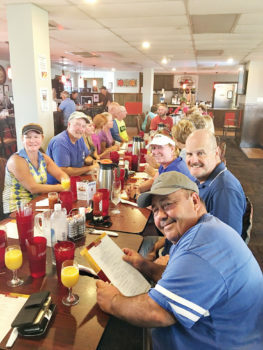 The club has open play every Monday at 7:00 a.m., Tuesday at 7:00 p.m. and Friday at 7:00 a.m. until October 1. The club is also gearing up for a fun-filled 2018/2019 season. We are currently planning the Alzheimer Charity Benefit tournament that will take place on February 9 and 10 of 2019. Events will start at 8:00 a.m. each morning. Registration for the tournament will begin November 1, 2018. We will be looking for volunteers to set up, clean up, make trophies, solicit vendors for sponsorships and donations for the raffle. The club will also host a fun-filled end of year event followed by lunch in the Horizon Room. The SunBird Pickleball Club has a new glass case across the breezeway from the post office. Look for the case with two pickleballs on top of it. You can sign up for new player orientation or pick up a flyer with club information on it. Tuesday and Thursday 2:00 to 5:30 p.m.
Sundays are open play – sign up for a court if you’d like to play. Tell all your friends. Want to volunteer? Have an idea that you want to share? Have a question? Feel free to reach out to Dan and Marianna at 480-285-4501 or mariannabuescher@gmail.com.